China’s response to piracy has had broader implications for its overall foreign policy. Part one of a two-part series. Maritime piracy is one of many non-traditional security challenges that confront China and other states in the 21st century. After flourishing for over two decades, why has piracy elicited a greater response from China than have other security threats? 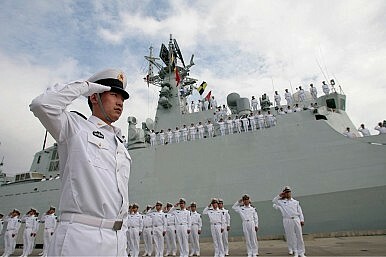 The answer lies in the confluence of strategic, political and economic factors – particularly the last: in recent years, China has developed a burgeoning “ocean economy.” Across all three of these dimensions, the People’s Liberation Army Navy (PLAN)’s robust presence in the Gulf of Aden (GoA) through fifteen deployments since December 2008 demonstrates Beijing’s growing realization that inaction is becoming less affordable in the maritime commons. As China’s GoA approach shows, it has recognized the imperative of actively protecting its ocean economy lifeline. Attacks in and around the GoA have produced the greatest threats to sea lines of communication (SLOC) stability for much of the 21st century, though Somali piracy plummeted during 2012-13 from its 2010 peak, largely because of coordinated naval operations in the region. Despite positive results, pirate attacks continue to trend subtly upward in less-governed maritime regions such as the Gulf of Guinea, and navies remain vigilant about the threat of global piracy. States concur that piracy is largely rooted in the failure of domestic governance institutions, which, in places like Somalia, are still extremely volatile and unstable. As China’s deputy permanent representative to the UN emphasizes, military action can only mitigate the scourge of Somali piracy. Yet with no nation willing to intervene systematically on land, seaborne mitigation is the order of the day. Piracy threatens to disrupt SLOCs through which 90% of the world’s trade flows, creating major challenges for seafaring states. China is no exception. Antipiracy operations thus represent a critical test for Beijing, not only operationally, but also in terms of policy and symbolism. The economic incentives are perhaps the strongest. The economic drivers behind the PLAN’s deployment to the GoA and its sustained presence there are inevitable products of China’s “going out” policy. In particular, China’s economy, even more than its military, is increasingly looking to the seas for new growth outlets. That in turn makes the links between SLOC security and the stability of China’s growing “ocean economy” ever more critical. China’s first ocean economy linkage is energy security. China’s tenth, eleventh and twelfth five-year guidelines (for the years 2001-05, 2006-10 and 2011-15, respectively) emphasized the need to address environmental concerns and diversify energy supplies. More specifically, the plans called for China to boost natural-gas consumption and find new sources of oil to reduce its coal reliance. That would entail a significant increase in both oil and gas imports in the near future, making secure SLOCs even more critical for safeguarding energy supplies to fuel China’s economic growth. Virtually all of China’s transportation runs on oil, with no immediate substitute available. Oil is also irreplaceable as a fuel for the majority of China’s military air and naval assets, not to mention trucks and off-road machinery crucial to economic growth. Since China became a net oil importer in 1993, its oil import dependence has risen steadily to roughly half of its needs at present, with 80 percent of it delivered by sea. In other words, China currently relies on maritime transport for 40 percent of its oil. Domestic estimates project Chinese oil import dependence in 2030 to be between 65-80%. Moreover, China became a net natural-gas importer in 2007, and imports of shipborne liquefied natural gas (LNG) have begun to compete with traditional fuels in coastal China, both for residential use and in the booming shipping industry.